From the “We’re not sure how we feel about this” department: People attending the SXSW conference in Austin, Texas have a new way to get online — homeless people. 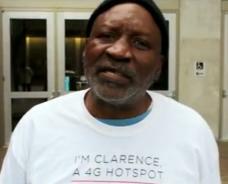 The Bartle Bogle Hegarty marketing firm has launched a non-profit drive called “Homeless Hotspots.” Basically, they supply homeless Austin residents with a 4G MiFi hotspot; the homeless people wear a shirt listing their name and access info for the hotspot; and you give the homeless person a donation (which he then keeps) to use the connection. It’s a kind of interesting setup that solves an accessibility problem and puts cash in the pockets of those who need it, but a lot of people are expressing unease about it. A lot of the discontent revolve around the wording on the homeless people’s shirts, which read “I’m , a 4G hotspot.” Some would rather the shirts say “I’m running a 4G hotspot” or something similar. Semantics aside, there’s no questioning the good that comes from the program: BBH supplied the hotspot devices for free, and the homeless “managers” get to keep the money they raise from people using the service. (BBH suggests a donation of $2/15 minutes, and allows you to donate to specific managers/hotspots via PayPal on the homelesshotspots.org website if you don’t have cash on hand.) BBH, of course, gets a case study in new advertising/message campaigns. As we said, we’re not really sure how to feel about this. Offhand, it seems like a decently well-intentioned, innovative idea, but turning the homeless into roaming 4G hotspots just seems like something from a dystopian sci-fi novel. What are your thoughts? Thanks to Wired.com for pointing this out! Image taken from this YouTube video.